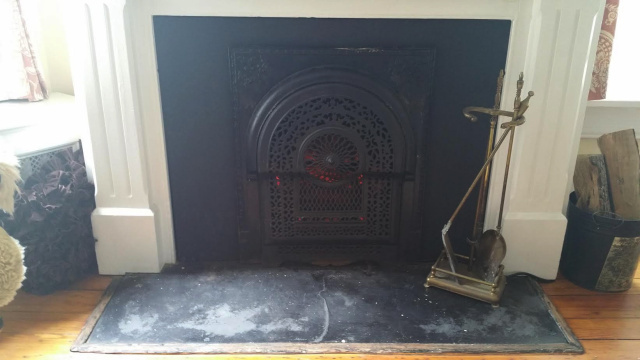 In many turn of the century homes it's common to see a coal fireplace with a door that's an open grate. Usually, this was never a proper fireplace but instead was a passive heating system that made use of the hot vented air from a downstairs fireplace. Aldine was the best known manufacturer of these systems, but there were a number of manufacturers of similar products and site-designed methods. This drawing below right from Aldine's 1906 catalog shows how the system worked. There was an operable coal fireplace downstairs that was vented through a pipe that ran inside the chimney. A metal vent pipe produces considerable heat and Aldine designed a couple of methods of reclaiming the heated vent air to share it with rooms above. 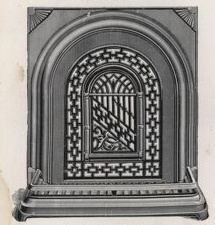 As shown in the drawing, one was to install a simple grate in the baseboard through which heated air could escape into the living space. The other was by installing a faux fireplace with a decorative grate that looked like a summer cover. 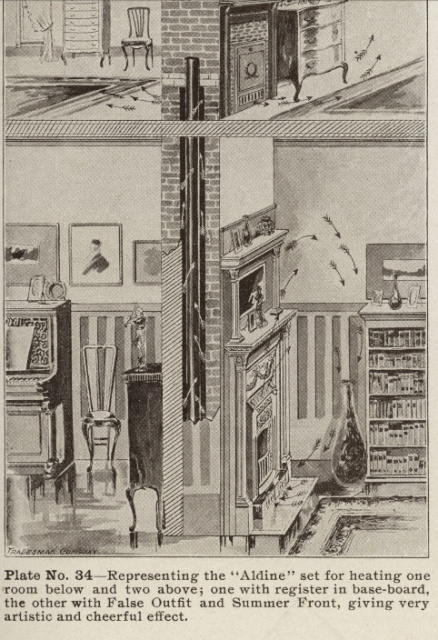 In Richmond it was common to create a similar faux fireplace in the second parlor or the dining room, as the chimney passing through actually vented a furnace located in the basement below. What we know now, of course, is that simple steel pipe is not suitable for use inside of a chimney. First, air movement around this pipe - or chimney liner if you will - causes the air to cool down; this slows draft, causes excessive smoke and thereby increases creosote and soot buildup. The metal pipe (often cast iron) won't hold up to the moisture condensation inside of the masonry chimney and the corrosiveness of creosote or coal soot, so the pipe rotted out relatively quickly. This created a horribly dangerous situation because deteriorated pipe sections would then allow fumes - like carbon monoxide - to escape the intended chimney liner and leak right into the bedroom. On a side note, several of the old books I've read on fireplaces, chimneys and old-time venting principles, mention a common wintertime malady known as "house malaria" and address a means of bringing in fresh air to help the illness they didn't know was actually carbon monoxide poisoning. Since these were never meant to be proper fireplaces, often there's a grate but no real fireplace because it was not actually ever a fireplace there to burn fuel in... it was simply an air register with a pretty mantel around it. Sometimes it's not practical to make these old faux fireplaces usable because the chimney isn't large enough to install a chimney liner to vent a second fireplace, so there's a challenge in just how to use them. In some cases there's a large enough opening behind the cover to insert an electric fireplace, which provides a warm glow and even some heat, as we installed in a customer's bedroom fireplace shown below. And since it's electric there's no venting to be concerned with.